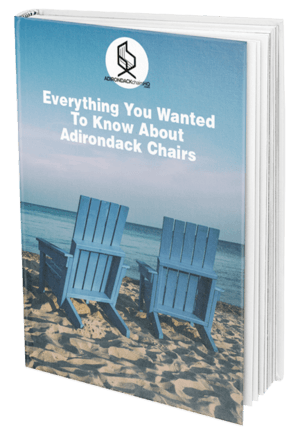 [Updated 9 January 2019] Whether you are lounging at the lake house or relaxing in your own backyard, the timeless design of the Adirondack Chair has your back…literally. Originally made from simple wood slats and a design meant to minimize the amount of wood used while providing excellent support for your back and hips, today Adirondack chairs are produced in various materials including plastic, recycled resin, wrought iron, wicker and the original wood. We will focus on wicker Adirondack chairs below. Adirondack rocking chairs have the same comfort and look of a traditional Adirondack chair except the legs are on rockers. If you enjoy the rhythmic comfort of a rocker, you may wish to consider an Adirondack rocking chair; it makes a great addition to a front or back porch. A comfort back has a slight curve to it rather than the traditional straight back. You may want to sit in one of these models before purchasing because, depending on your size, the curve of the back may not fit you. This type of chair has hinges that allow you to fold it flat for easy storage, which is great if you don’t have a lot of storage space. They’re often made of wood that can’t be left out in tough weather. Foldable chairs are also more portable if you want to take them camping or on vacation. Oversized seats work well for anyone who is taller or larger than average. They give you more space and room to get comfortable. The back of a reclining Adirondack chair can fold down nearly flat for sunbathing. These models often include a footrest so you can lie flat on your back with your feet extended. Adirondack porch swings fit two or three people and are a lovely way to relax on a summer evening. These chairs offer smoother movement than a rocker but still provide a rhythmic way to relax. Adirondack-style loveseats have two backs with one seat. They make a fun addition to your outdoor space if you need lots of extra seating. Wicker has been used to make outdoor furniture for years and for good reason. Many people mistake wicker for a material but it is actually a technique utilized in making the furniture. It can, therefore, be made out of different materials and natural wicker is usually made out of willow, rattan or bamboo. 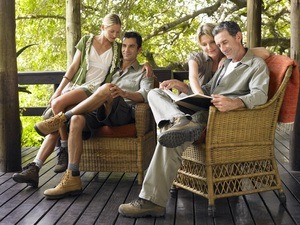 Wicker has some great advantages as a furniture material. Not only does wicker look great, it is also very durable. Well-made and tightly-weaved wicker furniture can last you several years without any problems. It is also a more stable material to use because of its tight weave. And without the chance of splinters, like with wood, it can be safer to use when you have small children. The materials normally used to make wicker furniture are very resilient to weather, sun damage and general use thus increasing the lifespan of the furniture piece. But wicker does have a couple characteristics which you should consider. Wicker furniture can be a bit expensive in comparison to other materials, especially, the furniture made from natural materials like willow, rattan, and bamboo. There is a lot of skill and effort going into making this furniture so the cost of labor is added to the price. Wicker furniture requires frequent cleaning to maintain its look and shine. Dust and debris can settle into the weaving and damage it if the furniture isn’t cleaned properly on a regular basis. When exposed to moisture, this furniture can be susceptible to mildew, especially the wicker furniture made from natural materials; the one way to combat this problem is to coat the furniture with varnish. Though this furniture is resilient and resists fading in the sun, overexposure can cause the color or finish of furniture to fade over time and lose its luster. Now that you have a good feel for Adirondack chairs and Wicker, let’s look at some great options for your next outdoor purchase. The modern take on the classic design offers the strength and durability of wicker with a more contemporary style. The Best ChoiceProducts Wicker Adirondack Chair is a little lower to the ground than some other versions and comes with an outdoor seat cushion. Customers who have purchased this chair praised it for its look, ease of assembly (only 4 parts plus the cushion) and its comfort. The PatioFlare Premium Wicker Adirondack Chair 2 Pack is a brown wicker with a grey cushion. It also features a more modern look with a swept back and wide armrests. Customers who purchased this chair remarked that it was a great design and very comfortable. It was also considered a great value for the price, but some customers found its assembly to be a challenge. One more from our friends at Patio Sense is this slightly higher priced Adirondack chair. Aside from the obvious color difference, this chair also features a lumbar pillow and is slightly larger in size. 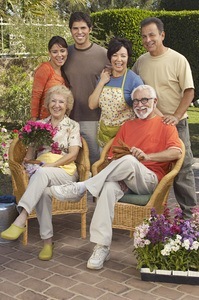 Customers universally praise its comfort and durability, but still are not happy with the less-than-easy assembly. We have a more in-depth review of the chair here. Although you would be happy with any of the choices here as all three chairs offer great comfort, a modern design that would blend with almost any patio or pool area and the durability and strength of wicker in a natural material, theBest ChoiceProducts Wicker Adirondack Chair must get the nod for its ease of assembly.